I love making homemade pizza. There's nothing better than pulling a hot pizza out of the oven and cutting into it. 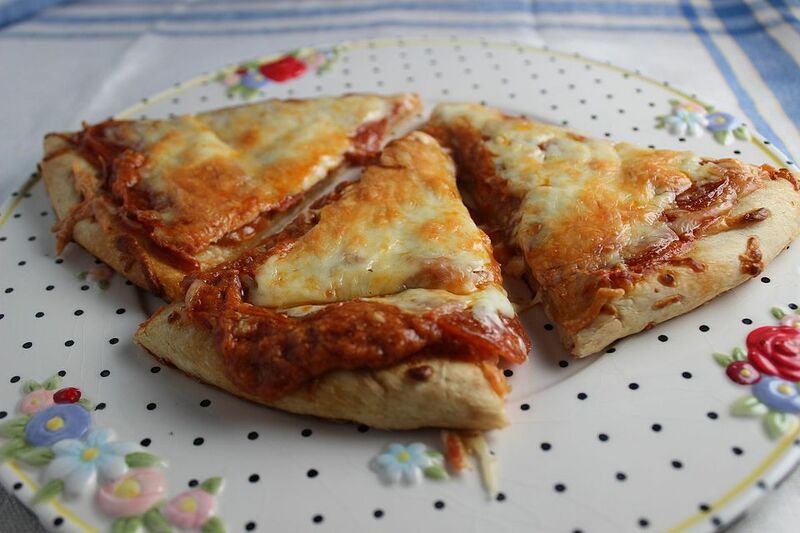 The cheese oozes out, the crust is crisp and shatters when you bite into it, and the flavor of the sauce is perfect. You can make this pizza sauce mild or hot, depending on your tastes. If you like really spicy flavors, add some chopped jalapeno peppers or serrano peppers, some really well-drained canned green chiles, or some cayenne pepper or chili powder. Some pickled jalapeno peppers would be great, as would chipotle peppers in adobo sauce. If, however, you want a milder pizza, use the spices that I use in this recipe. You can, of course, add your own favorite toppings to this wonderful sauce. Everything from Canadian bacon and pineapple, to mushrooms and bell peppers, to cooked sausage and lots of onion, are delicious with this sauce. (If you want to add mushrooms, use drained canned ones; otherwise saute the mushrooms in the olive oil along with the onion before you use it.) You can also change up the cheese. Use provolone, or Havarti, or Swiss, or cheddar. It's all up to you! Serve this pizza with a glass of icy cold beer and some crudites with a ranch salad dressing dip. Preheat the oven to 400 degrees F. Cook the onion in the olive oil until tender in a large skillet over medium heat. Add the tomato sauce, paste, mustard, seasonings and water. Cook, stirring frequently, over low heat until thickened and blended, about 10 minutes. If you're using the canned pizza dough, unroll it onto cookie sheets and prebake according to the package directions until the dough is set. Doing this makes the crust crisper and makes the pizza sturdier. It also makes the crust taste better and gives it a better texture. Spread the sauce evenly over both of the pizza crusts and sprinkle toppings over all. Sprinkle evenly with the cheese. Bake the pizzas at 400 degrees F for 15 to 25 minutes or until the pizzas heated through, the crust is crisp and golden brown, and the cheese is melted and beginning to brown.